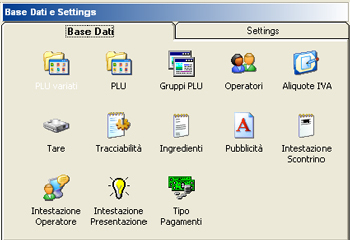 Complete configuration of the scale from PC and management of the system and the connections to external devices (labeller, printer, keyboard, etc.). Transmission and storage of all the data processing by the Helmac scale. Totalisation function on the data acquired from the scale. Operational: use, cash registers, advertising, cash management and customer management. Ticket and Price computing mode. Communication: type of connection to the local network, to PC and external devices such as cash registers, bar code reader etc. Keyboards, Password and Hot Keys. Database of monthly and annual totals. Grouping data by: articles, PLU groups, operators, VAT rates, types of payment.